The film begins with the following statement: “This is a story of two worlds — the one we know and another which exists only in the mind of a young airman whose life and imagination have been violently shaped by war. Any resemblance to any other world, known or unknown, is purely coincidental.” It’s a playful opening, and can be interpreted in more than one way. 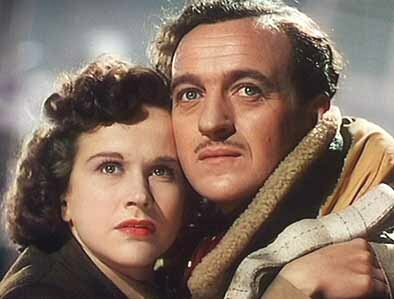 “The Archers” (the name Powell and Pressburger used for their partnership) had a light touch, and were able to weave magical realism into their stories without ever seeming childish or silly. After a cheeky narrated tour through the cosmos, we see Squadron Leader Peter Carter (David Niven), his Lancaster bomber in flames and about to crash. Peter’s parachute is shot too full of holes to function properly, and he is desperately trying to reach someone on the radio. Next to him lies the body of Flying Officer Bob Trubshawe (Robert Coote). Peter manages to get in touch with June (Kim Hunter), an American radio operator, and pours out his heart to her. Finally, he professes his love before leaping out of the bomber without a parachute. The scene in which Niven wakes up in the pounding surf and believes himself in the afterlife is a masterpiece of subtle humor. He stands, breathes deeply, and walks toward the beach with a beatific gaze, shedding his earthly raiments. The first person he sees is a boy playing a pipe, tending sheep, so why wouldn’t he think he’s passed on to his final reward? Meanwhile, his mate Bob finds himself in the “other place,” an otherworldly bureacracy in which angel wings arrive en masse on long runners, ready to be attached to newly arrived bodies, and businesslike clerks take names and hand out assignments. Bob is told that there was a clerical error that caused Peter to fall through the cracks, and that he’ll need to be collected forthwith. The scenes on terra firma are filmed in beautiful Technicolor, while the scenes in the afterlife are filmed in black and white. (Technically it’s “monochrome Technicolor,” not proper black and white, but since I’m not as big of a film nerd as Martin Scorsese, I couldn’t tell the difference.) It’s a simple but brilliant stylistic choice, and it’s way ahead of its time. Films in the ’30s or ’40s that mixed black and white with color film invariably depicted the fantastical world in color and the prosaic world in black and white. To do it the other way around looks forward to the ’80s, when black and white was coming back into vogue, and filmmakers like Scorsese and David Lynch showed just how surreal and otherworldly black and white film could look. June and Peter fall in love, but for Peter, time occasionally stops all around him while a ridiculous French aristocrat from the other world known as “Conductor 71” (Marius Goring), pays him visits. June’s friend Doctor Reeves (Roger Livesey) believes that Peter’s visions aren’t supernatural, but symptoms of a brain injury. Eventually this “matter of life and death” comes to a head as Peter is operated on in our world while simultaneously facing trial in the other. A Matter of Life and Death is a fantastic film that is satisfying on both a technical level and an emotional level. The performances are all wonderful, and Powell and Pressburger are masterful filmmakers. Incidentally, in a 2004 poll of 25 film critics in Britain’s Total Film magazine, A Matter of Life and Death was named the second greatest British film of all time, sandwiched between Get Carter (#1) and Trainspotting (#3). Posted in 1946, December 1946, November 1946 and tagged A Matter of Life and Death, Abraham Sofaer, Allan Gray, Betty Potter, Bob Roberts, Bonar Colleano, British Cinema, David Niven, Drama, Eagle-Lion Films, Edwin Max, Emeric Pressburger, Fantasy, George R. Busby, Independent Producers, Jack Cardiff, Joan Maude, Kathleen Byron, Kim Hunter, Marius Goring, Michael Powell, Raymond Massey, Reginald Mills, Richard Attenborough, Robert Atkins, Robert Coote, Roger Livesey, Romance, Stairway to Heaven, The Archers, Universal Pictures. Bookmark the permalink. fatto quale fra i femminizzati non ci sono maschi.